The Incredibles, Pixar Animation Studios’ sixth feature film, written and directed by Brad Bird and released in 2004, follows the adventures of Bob Parr (a.k.a. Mr. Incredible) and his family of super-powered individuals after vigilantism has been outlawed. Forced to hang up their tights, Mr. Incredible and Elastigirl raise their three children out of the public eye and lead a seemingly normal suburban life. That is, when Mr. Incredible can resist the urge to relive the glory days, which compromises his family’s secret identities and forces them to move with the assistance of the Superhero Relocation Program. When Mr. Incredible loses yet another job for taking out his frustrations on his apathetic boss, he jumps at the opportunity to suit up once more when offered a lucrative covert mission. A mysterious benefactor seeks his help in containing a malfunctioning robot known as an Omnidroid. But things quickly get out of hand when Mr. Incredible learns that the machine is being used to test former superheroes and kill them, each trial leading to a newer and deadlier model of the droid. Worst yet, they are being created and controlled by a former super-fan-turned-evil-tech-genius who he had shunned years before. Fortunately for Mr. Incredible, his greatest super power is not his strength or his super durability, it’s his family. Mr. Incredible is the focal point of the movie and as such receives the most attention in the opening act of the film. It’s through his actions that we see how the Supers fall out of favor. His Save Civilian point for this act comes when he rescues a man jumping from a skyscraper but that heroic deed is what leads to superheroes being sued and then outlawed. But it’s not all bad for Bob Parr as he earns a Character Development when he marries Elastigirl, which of course earns her a Character Development as well. Outside of his power points for Business, Durability, Melee, Strength and Vehicle, Mr. Incredible Leads his friend Frozone in a Team-Up to Save Civilians in a burning building. Mr. Incredible scores 10 points in the opening act, while Elastigirl and Frozone each score five. Their powers included Ensnare, Melee and Stretch for Elastigirl and Ice and Ice Defensive for Frozone. The rest of the opening act focuses on introducing the remaining support characters and their abilities, most notably the Parr’s two oldest children Violet and Dash. Their sibling rivalry and squabbling earns them four points with three powers each. Violet shows off her Force Field and Invisibility powers, Dash puts up generic Speed and Speed Offensive. Both score a Melee during their slap flight around the dinner table. Jack-Jack, the Parr baby, gets a point just for his Appearance as his powers have yet to emerge. The mysterious character Mirage earns three points while monitoring Mr. Incredible in the opening act and utilizing her Business and Computer skills. Unbeknownst to the audience in the movie’s opening, we meet the primary antagonist Syndrome as a kid, Buddy Pine. We also get a taste of Buddy’s technological aptitude with his Flight power. He puts up two points, one less than the bonus character Bomb Voyage who endangers Buddy’s life with his Explosive and Weapon powers. Syndrome takes center stage in the second act of the movie and notches a Character Development point for revealing his origin to Mr. Incredible. He reveals his plan to Mr. Incredible during the typical villain monologue, a trope Syndrome calls himself on, while displaying his tech based abilities including Energy, Energy Defensive, Energy Offensive, Explosive, Flight, Suit, Tech and Weapon. Syndrome’s 12 points in the middle part of the movie include Leading his henchman and Defeating Mr. Incredible before the end of the act. That means Mr. Incredible’s Character Development of suiting back up and returning to his super heroic persona is short-lived and his Team-Up with Mirage did not go as he had planned. Despite his humbling defeat, Mr. Incredible scores another 10 points this act while using Agility, Computer, Durability, Intellect, Melee, Strength and Weapon. For her part in Syndrome’s plan, Mirage brings in five points including Leading Mr. Incredible to Nomanisan, Syndrome’s remote island base, and giving him his “mission” which counts as Business and Computers for her. However, her dedication to Syndrome begins to flounder when she witnesses his willingness to shoot down a plane carrying Mr. Incredible’s family. 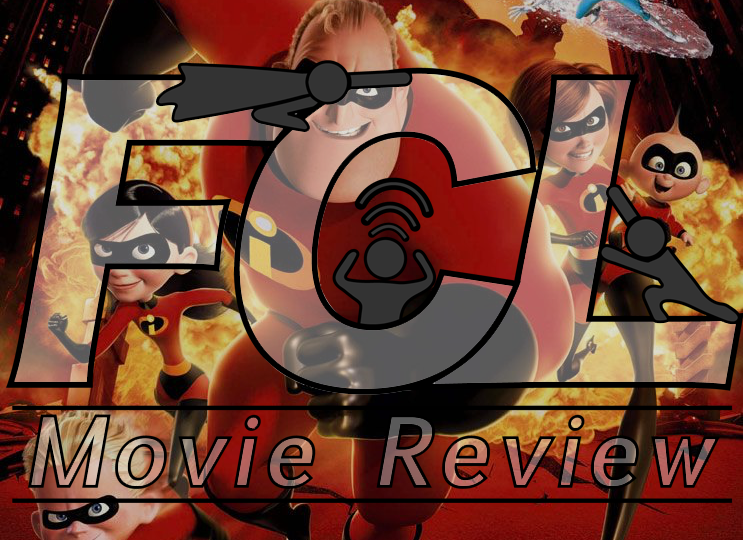 Elastigirl’s mission to find her husband takes a turn for the worst at this time when she also discovers her two oldest children had stored away on her plane. She earns an unexpected Lead Team at this point to give herself a total of six points combined with her Morph, Stretch, Tech and Vehicle powers. 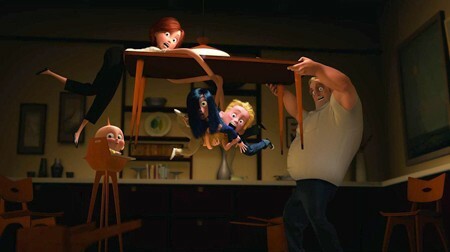 Violet and Dash each score a power in this act along with their Appearances for a total of two each, while Jack-Jack merely shows up before he is left with the over-confident babysitter Kari when the rest of the family flies to Mr. Incredible’s rescue. The final act involves two big action scenes, one with the family escaping Nomanisan Island and one with the heroes returning to Metroville to stop Syndrome. Despite the antagonist’s use of Energy, Defensive Energy, Flight and Tech abilities, he loses control of the Omnidroid v.10 and flees the scene. The droid is not the only character to turn on Syndrome. Mirage earns a bit of redemption, and Character Development, when she Teams Up with Mr. Incredible and frees Mr. Incredible at the start of the act. This allows the Parr family to reunite and attempt to ruin Syndrome’s plan before he travels back to Metroville. Unfortunately, they are captured once more despite their impressive first time working together as a family unit. Elastigirl Leads the family and scores 11 points, as does Violet. The ladies respectively use Durability, Melee, Morph, Stretch, Tech and Weapon and Computer, Force Field, Force Field Defensive, Intellect, Invisibility, Tech and Weapon. Mr. Incredible also gets a turn to Lead but secures 10 points with Durability, Intellect, Melee, Strength and Weapon, but Dash’s limited skill set and lack of a leads keeps him at a total of 8 points for the final act. He puts up a Melee, generic Speed and Defensive and Offensive Speed. All four of the main characters also earn a Team-Up with Frozone when they free themselves and return to Metroville and Defeat the Omnidroid v.10 in a group effort. Frozone is the only main character to miss out on appearing in all three acts, but he is the first hero to take to the streets when he notices the rampaging Omnidroid. He earns a Character Development for suiting up again after engaging in a light-hearted humorous back and forth with his wife. His Suit’s built-in snowboard, plus his Durability, generic Ice, Defensive and Offensive Ice powers account for five of his nine points in the final act. With the Omnidroid defeated, the Incredibles return home to a few surprises. The first being that Syndrome has kidnapped Jack-Jack, the second being that Jack-Jack has Developed his powers. The baby displays his Flames, Melee, Monster Form and Steel Form, taking Syndrome by surprise and Defeating the villain for a total of seven points. This leads to Syndrome’s final fatalistic Character Development when his ill-advised cape gets sucked into his airplane engine. He finishes with a total of six points in the final act. 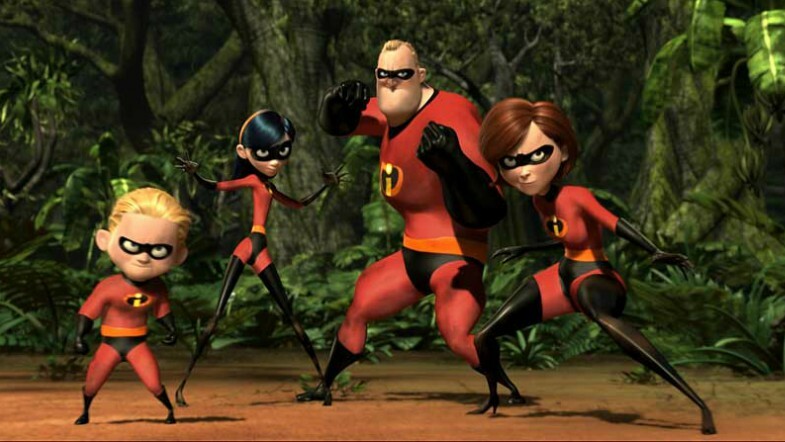 The final scene gives all four of the main Incredibles Character Development when they embrace their roles as part of a super family and face Underminer, the surprise bonus character. He breaks through the earth in his large drill Vehicle but picked the wrong place and time. Outside of Dash’s track meet the Incredibles put on their masks, ready and united to face this new threat.